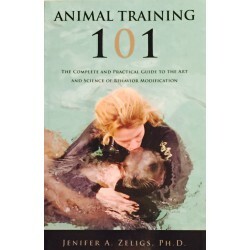 by Jenifer A. Zeligs, Ph.D.
Other animal training books focus on only a few chosen techniques, Animal Training 101 thoroughly explains the entire spectrum of training methods. Dr. Zeligs provides a cost-benefit analysis of each approach, while focusing on maintaining a trusting, positive relationship between animal and trainer. This well-organized reference enables you to easily find the optimal techniques to solve your specific training challenges and to decide which techniques best suit your individual needs. It is a must-have for anyone interested in animal training in either domestic or professional settings.